Autosomal dominant polycystic kidney disease pathogenesis can be recapitulated in animal models by gene mutations in or dosage alterations of polycystic kidney disease 1 (PKD1) or PKD2, demonstrating that too much and too little PKD1/PKD2 are both pathogenic. Gene dosage manipulation has become an appealing approach by which to compensate for loss or gain of gene function, but the mechanisms controlling PKD2 expression remain incompletely characterized. In this study, using cultured mammalian cells and dual-luciferase assays, we found that the 3′ untranslated region (3′UTR) of PKD2 mRNA inhibits luciferase protein expression. We then identified nucleotides 691–1044, which we called 3FI, as the 3′UTR fragment necessary for repressing the expression of luciferase or PKD2 in this system. Using a pull-down assay and mass spectrometry we identified far upstream element-binding protein 1 (FUBP1) as a 3FI-binding protein. In vitro overexpression of FUBP1 inhibited the expression of PKD2 protein but not mRNA. In embryonic zebrafish, FUBP1 knockdown (KD) by morpholino injection increased PKD2 expression and alleviated fish tail curling caused by morpholino-mediated KD of PKD2. Conversely, FUBP1 overexpression by mRNA injection significantly increased pronephric cyst occurrence and tail curling in zebrafish embryos. Furthermore, FUBP1 binds directly to eukaryotic translation initiation factor 4E-binding protein 1, indicating a link to the translation initiation complex. 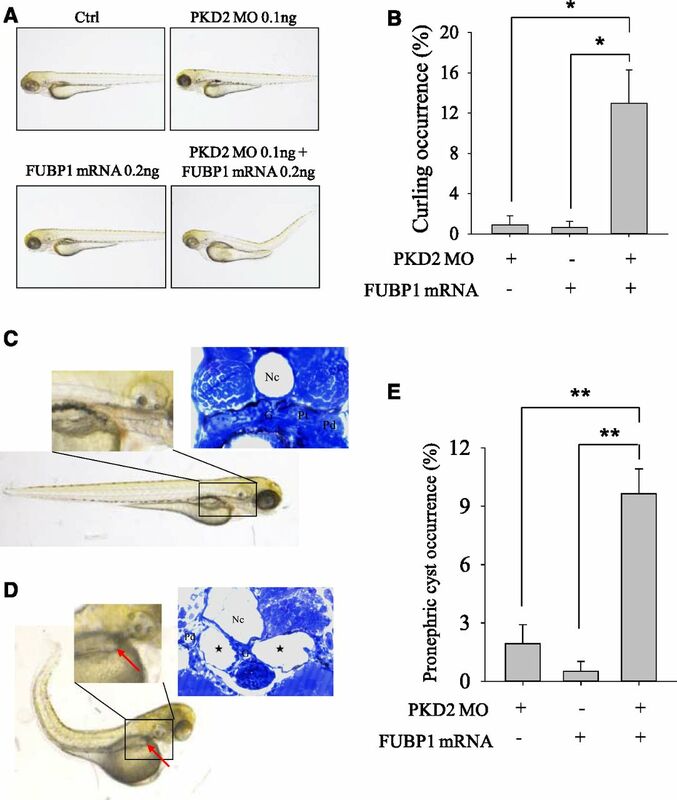 These results show that FUBP1 binds 3FI in the PKD2 3′UTR to inhibit PKD2 translation, regulating zebrafish disease phenotypes associated with PKD2 KD. Human autosomal dominant polycystic kidney disease (ADPKD) is associated with renal and hepatic cysts and, to a lesser extent, pancreatic cysts and vascular defects.1,2 In humans, ADPKD is caused by mutations in the polycystic kidney disease 1 (PKD1) or PKD2 genes, which encode the membrane receptor and ion channel proteins PKD1 and PKD2, respectively. In animal models, including mouse, rat, and zebrafish, ADPKD can be recapitulated, at least in part, by loss- or gain-of-function of PKD1 or PKD2.3–8 Therefore, the protein expression, membrane localization, and function of PKD1 and PKD2 are highly regulated under normal physiologic conditions. PKD2 (also called polycystin-2 or transient receptor potential polycystin-2), is a 968-amino-acid (aa) integral membrane protein that acts as a cation channel permeable to calcium ions, sodium ions, and potassium ions.9 PKD2 is expressed in numerous tissues, including kidney, liver, pancreas, lung, heart, brain, intestine, and reproductive organs. PKD2 expression/function is regulated by a number of binding protein partners such as PKD1, TRPC1, α-actinin, mDia1, Id2, IP3R, and EGFR.10–16 PKD2 expression can also be regulated through its 3′ and 5′ untranslated regions (UTRs). RNA-binding protein bicaudal C (Bicc1) disrupts the translational control of PKD2 by microRNA-17 (miR-17) by competing for the same binding site in PKD2 3′UTR, and the lack or insufficiency of Bicc1 in mouse, zebrafish, and Xenopus laevis results in renal cysts and other defects through reduced PKD2 dosage.7,17 Cellular stress conditions and phosphorylated eIF2α up-regulate PKD2 translation via the 5′ upstream open reading frame of PKD218, whereas they inhibit global protein translation. Regulation through UTRs is not as well understood as regulation through protein–protein interactions. 3′UTR-mediated regulation is usually through binding of a 3′UTR-binding protein that works either by affecting RNA stability or by regulating protein translation through interacting with the translation machinery that is in contact with the 5′UTR,19 and may also be proximate to 3′UTR through the formation of a ‘closed-loop' or circular' mRNA structure.20,21 Transcript circularization can occur via the formation of an eIF4G-poly(A)-tail-binding protein complex that promotes recycling of the 40S ribosome from the 3′UTR to the 5′ terminus.22 Alternatively, circularization can occur through interaction of the 3′UTR-binding proteins with specific initiation factors thereby regulating protein translation.23,24 In either scenario, disruption of the 5′–3′ interaction affects protein translation. In this study we first identified a PKD2 3′UTR fragment and its binding protein, called far upstream binding protein 1 (FUBP1), which together mediate downregulation of PKD2 translation in cultured cells. We then used zebrafish to examine the effects of FUBP1 morpholino oligonucleotide (MO) knockdown (KD) and overexpression on PKD2 translation, PKD2-dependent tail curling, and pronephric cyst formation. Finally, we performed coimmunoprecipitation (co-IP) and glutathione-S-transferase (GST) pull-down assays to reveal the physical link between FUBP1 and eukaryotic initiation factor-4E-binding protein-1 (4EBP1). We previously reported that PKD2 5′UTR mediates the translational up-regulation of PKD2 under cellular stress conditions.18 In an effort to determine whether the PKD2 2087-nucleotide (nt) 3′UTR regulates its protein expression we performed dual-luciferase assays with vector BI1625, which we used in our previous study.18 BI16 contains a bidirectional promoter that drives the transcription of the renilla and internal control firefly luciferases. We ligated PKD2 5′UTR/3′UTR upstream/downstream of the renilla luciferase gene to form the plasmids BI16–3′UTR, 5′UTR–BI16, and 5′UTR–BI16–3′UTR, and found that the luciferase activity in HeLa cells transfected with BI16–3′UTR is much lower than those transfected with control plasmid BI16 (Figure 1A). A similar inhibitory effect of 3′UTR was found in the presence of 5′UTR (by comparing between 5′UTR-BI16–3′UTR and 5′UTR-BI16). Of note, 5′UTR also exhibited an inhibitory effect on the luciferase activity, in agreement with our previous report.18 To determine whether 3′UTR affected PKD2 mRNA stability we performed end-point and real-time RT-PCR assays and found that the PKD2 mRNA level is not significantly altered by 3′UTR or 5′UTR (Figure 1B), suggesting that 3′UTR represses the protein translation of luciferase. Effects of PKD2 3′UTR and 5′UTR on luciferase activity in HeLa cells. (A) Effects of 3′UTR on the relative luciferase activity revealed by dual-luciferase assays in the presence or absence of 5′UTR. (B) Effects of 3′UTR on the mRNA level revealed by real-time RT-PCR assays in the presence or absence of 5′UTR. WBs show representative data. (C) Effects of 3′UTR fragments nt 1–1044 and nt 1025–2087 on the relative luciferase activity revealed by dual-luciferase assays in the absence of 5′UTR. (D) Effects of the binding domain (nt 118–145) for miR-17 in 3′UTR on the luciferase activity in the presence of 5′UTR. 3′UTRΔmiR-17 and nt 1–1044ΔmiR-17 indicate 3′UTR and nt 1–1044, respectively, with deletion of miR-17-binding domain, nt 118–145. Statistical data are mean and SEM values from three independent experiments. Control (Ctrl) indicates the absence of any 3′UTR fragment, but with the presence of 5′UTR. NS, not significant. **P<0.01; ***P<0.001. Next we further divided nt 1–1044 and nt 1025–2087 into overlapping fragments and identified that nt 1–1044 and nt 691–1044 mediate inhibition of luciferase, whereas nt 1025–1129 mediates stimulation (Figure 2). Of note, the nt 691–1044 fragment had slightly less inhibitory effect on luciferase expression than nt 1–1044 (Figure 2A), although the reason for this is unclear. It is possible that nt 1–1044 has a more favorable conformation than nt 691–1044 in terms of interacting with the to-be-identified inhibitory binding partner. Because shorter fragments of nt 691–1044 and nt 1025–1129 substantially reduced the inhibitory and stimulatory effects, respectively (Figure 2, C and D), we called nt 691–1044 3′ fragment inhibitory (3FI) and nt 1025–1129 3′ fragment stimulatory (3FS). Of note, we selected nt 691–1044, but not nt 1–1044, because the former is much shorter and thus would be better for identifying specific binding partners. The inhibitory effect of 3FI on the translation of luciferase was supported by data obtained using mutant 3′UTR with 3FI deletion (Figure 3, A and B). Of note, 3FI is AU-rich (68%) and has no overlap with the binding site for miR-17 and Bicc1.7 We also performed Western blotting (WB) assays to verify the effects of 3FI and 3FS by directly detecting the protein level of renilla luciferase. We indeed found that the renilla luciferase in HeLa cells, and also in HEK 293T cells, is regulated by 3FI and 3FS, similar to the regulation observed in the luciferase assays (Figure 3C). In addition, by replacing the coding sequence of renilla luciferase in the plasmid by that of Flag-tagged PKD2, we found that 3FI and 3FS reduces and enhances Flag-PKD2 protein expression, respectively, in both HeLa and HEK cells (Figure 3D), which further confirmed the regulatory effects of 3FI and 3FS on protein translation. Effects of 3′UTR fragments on luciferase activity in HeLa cells. (A) Effects of 3′UTR fragments, including 3FI, within nt 1–1044, on luciferase activity as indicated. (B) Effects of 3′UTR fragments within nt 1025–2087 on luciferase activity, as indicated. (C) Effects of 3′UTR fragments within 3FI on luciferase activity, as indicated. (D) Effects of 3′UTR fragments within nt 1025–1324 on luciferase activity, as indicated. Statistical data are mean and SEM values from three independent experiments. Control (Ctrl) indicates the absence of any PKD2 3′UTR fragment or 5′UTR in the BI16 plasmid. *P<0.05; **P<0.01; ***P<0.001. 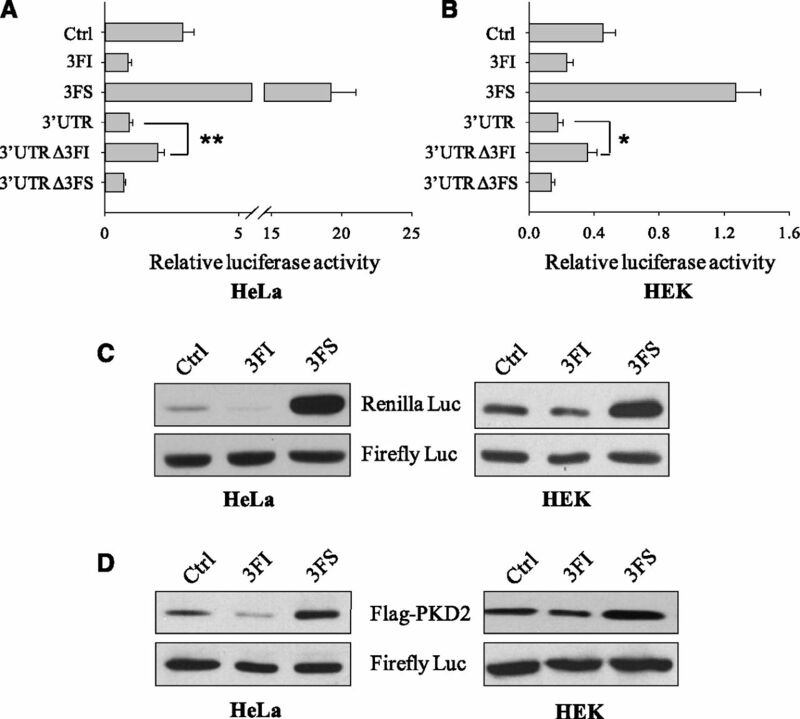 Effects of 3FI and 3FS on luciferase activity and protein expression of luciferase and PKD2 in HeLa and HEK cells. (A) Effect of 3FI (3′UTRΔ3FI) or 3FS (3′UTRΔ3FS) deletion from 3′UTR on luciferase activity in HeLa cells. 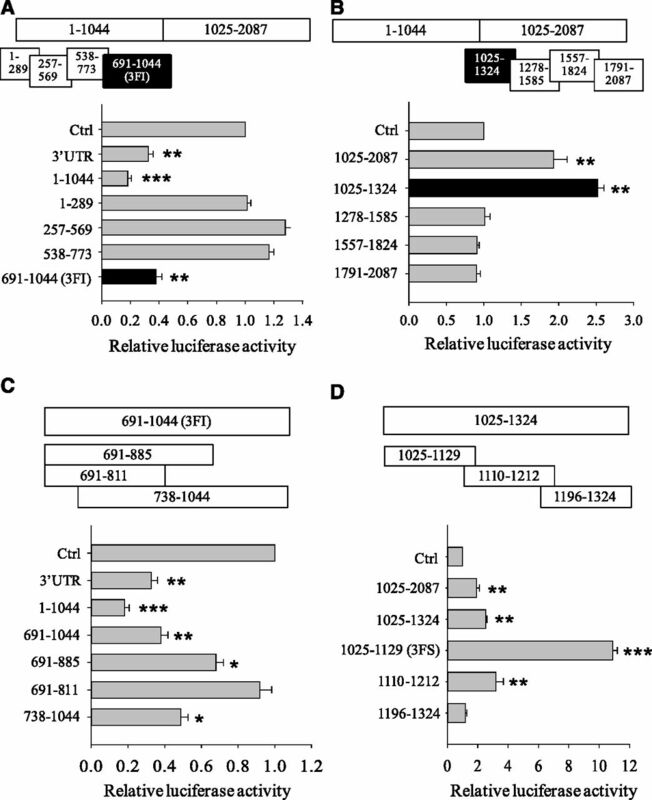 (B) Effect of 3FI or 3FS deletion from 3′UTR on luciferase activity in HEK cells. (C) Representative WB data showing the effects of 3FI and 3FS on the expression of renilla luciferase protein in HeLa and HEK cells, as indicated. Firefly luciferase blots serve as an internal control. (D) Representative WB data showing the effects of 3FI and 3FS on the expression of Flag-PKD2 in HeLa and HEK cells, as indicated. Firefly luciferase blots serve as an internal control. Statistical data are mean and SEM values from three independent experiments. Control (Ctrl) indicates the absence of any PKD2 3′UTR fragment or 5′UTR in the BI16 plasmid. *P<0.05; **P<0.01. We next wanted to focus on 3FI by examining how it downregulates PKD2 translation. We reasoned that there may be a RNA-binding protein that interacts with 3FI and mediates the inhibitory effect on translation. For this we used PCR products from plasmids BI16–3FI and BI16 (as a control) as a template for in vitro transcription using biotin-labeled uridine 5′-triphosphate to obtain biotinylated BI16–3FI and BI16 RNA fragments that were incubated with HeLa cell lysates, followed by pull-down using streptavidin beads (see Concise Methods). Proteins in the precipitated lysates were separated by SDS-PAGE for mass spectrometry analysis of bands present in the 3FI lane but not in the control lane, which identified FUBP1, FUBP2, and eIF4G as 3FI-interacting partners (see Supplemental Table 1 for a full list of the identified partners). FUBP1 and FUBP2 are DNA-/RNA-binding proteins that regulate transcription, translation, or mRNA stability of target genes, whereas eIF4G is a ribosomal protein and a key factor in the translation initiation complex. We then wondered whether FUBP1 and FUBP2 actually downregulate PKD2 expression. For this we performed WB assays using HeLa cells and found that overexpression of FUBP1, but not of FUBP2, indeed reduces the PKD2 protein level to 45±5% (n=3, P=0.004) (Figure 4A); however, FUBP1 had no effect on the PKD2 mRNA level. We also found that overexpression of nuclear fragile X mental retardation-interacting protein 2, another RNA-binding protein identified as a 3FI-binding partner (Supplemental Table 1), has no effect on PKD2 expression (data not shown). To verify the specificity, we also used siRNA to KD FUBP1 and found that FUBP1 KD in HEK cells led to an increase of 80±11% (n=3, P=0.01) in the PKD2 protein level while having no significant effect on the PKD2 mRNA level (Figure 4B). In order to determine whether translational inhibition by FUBP1 is mediated through 3FI, we cotransfected an FUBP1-expressing plasmid and luciferase plasmid BI16 without or with 3FI into HeLa cells and found that FUBP1 overexpression significantly reduces luciferase expression in the presence of 3FI, but has no effect in the absence of 3FI (Figure 4C). Consistently, FUBP1 KD by siRNA increased luciferase expression in the presence of 3FI, but had no effect in the absence of 3FI in HEK cells (Figure 4D). FUBP1 was previously reported to bind AU-rich regions of RNAs through a signature sequence of AUUUA.27 Indeed, human 3FI contains 68% AU and 3FI from six different species all contain one to three AUUUA sequences (Supplemental Figure 1). Taken together, these results show a specific effect of FUBP1 on PKD2 translation but not on its mRNA stability, and suggest that FUBP1 may have mediated, at least in part, our observed inhibitory effect of 3FI. Effect of FUBP1 on PKD2 protein and mRNA levels. (A) Effect of FUBP1 overexpression on PKD2 in HeLa cells. Left panel shows representative WB data. Center panel shows quantified WB data averaged from n=3 independent experiments. Right panel shows PKD2 mRNA expression by RT-PCR. 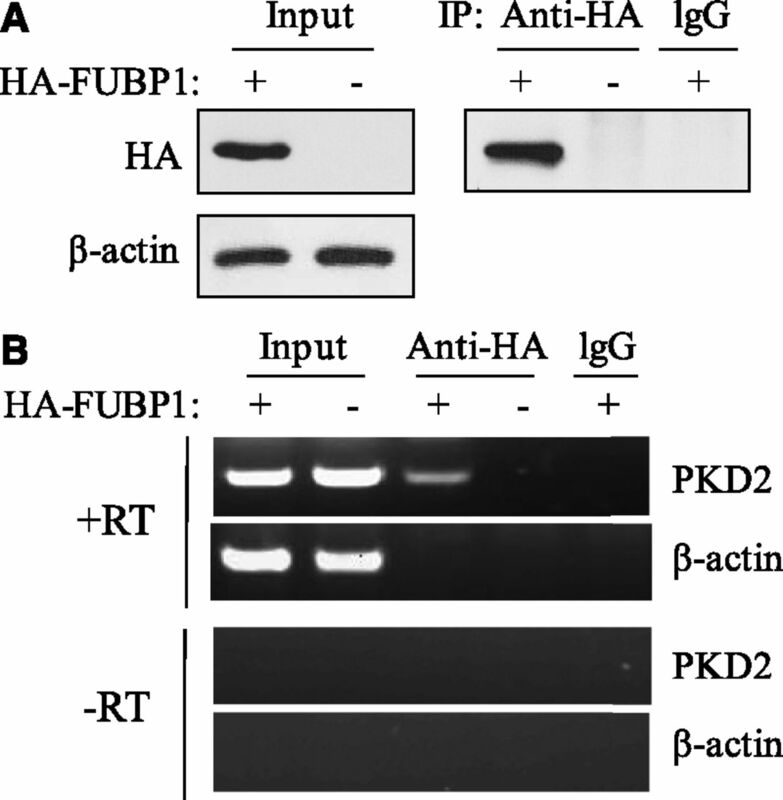 (B) Effect of FUBP1 siRNA KD on PKD2 expression in HEK cells. Left panel shows representative WB data. Center panel shows quantified WB data averaged from three independent experiments. Right panel shows PKD2 mRNA expression obtained by RT-PCR. (C) Effect of FUBP1 overexpression on activity of luciferase without (BI16) or with 3FI (BI16–3FI) as 3′UTR in HeLa cells. (D) Effect of FUBP1 siRNA KD on activity of luciferase without (BI16) or with 3FI (BI16–3FI) as 3′UTR in HEK cells. Data were obtained from n=3 independent experiments. *P<0.05; **P<0.01. Because FUBP1 was identified in vitro using biotin–RNA pull-down assays with fragment 3FI, it remains to be determined whether FUBP1 is able to bind native 3FI inside the cell in which full length PKD2 3′UTR has its distinct conformation. For this purpose we performed RNA-protein immunoprecipitation (RIP) assays by transfecting HeLa cells with human influenza hemagglutinin (HA)-FUBP1 or empty vector (control) and then precipitating HA-FUBP1 whole cell extracts using HA antibody (Figure 5A). After total RNAs were isolated from HA-FUBP1 immunoprecipitates, PKD2 mRNA was indeed detected by RT-PCR while no PKD2 mRNA was detected in control groups (Figure 5B), indicating that FUBP1 binds the endogenous PKD2 mRNA. Interaction between FUBP1 and native PKD2 mRNA. HeLa cells were transfected with HA-FUBP1 or empty vector. Forty-eight hours after transfection, cell lysates were immunoprecipitated with HA antibody or nonimmune rabbit IgG (control). (A) WB analysis of cell lysates (Inputs) and immunoprecipitates with antibodies indicated. (B) RT-PCR analysis of RNAs isolated from immunoprecipitates. +RT and –RT represent RT reactions carried out in the presence and absence of reverse transcription, respectively. Although zebrafish PKD2 mRNA 3′UTR is much shorter than that of human PKD2 mRNA 3′UTR (201 versus 2087 nt, respectively), the corresponding 3FI is also AU-rich (66%) and contains one AUUUA sequence (Supplemental Figure 1). Zebrafish FUBP1 also shares 68% aa sequence identity with human FUBP1. We next studied in vivo larval zebrafish to determine the regulation of PKD2 expression by FUBP1, and the associated disease phenotypes. For this, we injected commercially acquired MO antisense oligonucleotide against PKD2 or FUBP1, or both PKD2 and FUBP1, or control MO into one- to four-cell zebrafish embryos within 1 hour postfertilization. The same PKD2 MO sequence and injection procedure was used as previously reported.28 Two days after injection, we manually dechorionated embryos and found that fish with PKD2 MO injection, but not those with control MO injection, display curled tails (Figure 6A) and pronephric cysts, consistent with previously published results that the presence of the two phenotypes are significantly correlated to each other.29,30 Additionally, tail curling angle strongly correlated with PKD2 expression level (Figure 6D). We thus decided to use ‘tail curling' as a valid readout to examine the functional implications of regulation of PKD2 expression by FUBP1. Although FUBP1 MO injection alone did not lead to tail curling, fish with coinjection of FUBP1 and PKD2 MOs showed substantially reduced tail curling compared to PKD2 MO injection alone, indicating that FUBP1 KD rescues the phenotype caused by PKD2 KD. After 2 dpf, tail curling gradually increased in fish with PKD2 MO injection alone, while in fish with FUBP1 MO coinjection tail curling gradually decreased (Figure 6, A and C). On average, the angle of tail curling with PKD2 KD alone increased from 154±23° at 2 dpf to 224±32° at 5 dpf (n=55), showing increased severity with time, whereas the angle of tail curling with PKD2 and FUBP1 MO coinjection decreased from 58±11° at 2 dpf to 18±8° at 5 dpf (n=43), indicating a rescue effect that increases with increasing time. Effect of FUBP1 KD on PKD2 expression and tail curling in embryonic zebrafish. (A) Representative pictures of 2–5 dpf zebrafish. Embryos were injected with MO(s) of control (Ctrl; 2 ng), FUBP1 (1.5 ng), PKD2 (0.5 ng), or PKD2+FUBP1 (0.5+1.5 ng) within 1 hour postfertilization. Ctrl, Ctrl MO. (B) Representative WB data from 5-dpf larvae obtained using PKD2 and FUBP1 antibodies (Cat#: OAEB01480 and ARP37732_T100, Aviva System Biology). (C) Averaged tail curling angle for PKD2 (n=55) and PKD2+FUBP1 (n=43) MO injections. The angles for FUBP1 (n=76) and Ctrl (n=60) MOs were both zero and thus not plotted here. **P<0.01; ***P<0.001. (D) Tail curling angle plotted against PKD2 expression level from 12 individual fish at 5 dpf, showing correlation between tail curling angle and PKD2 expression level. PKD2 WB bands were quantified and divided by the corresponding β-actin bands using ImageJ and normalized to the fish showing no tail curvature. The curve is an empirical exponential decay fit that generated a correlation coefficient of R=0.93. We next examined PKD2 and FUBP1 expression in these fish by WB, using antibodies against zebrafish PKD2 and FUBP1. We found that MO injection effectively reduces PKD2 and FUBP1 expression, and that PKD2 expression increases in fish with FUBP1 MO injection (Figure 6B), in agreement with our in vitro data (Figure 4). These data indicate that reduced PKD2 dosage in larval zebrafish results in tail curling that is rescued or alleviated by FUBP1 KD through up-regulating PKD2 expression. Consistently, we found that combined injection of in vitro transcribed human FUBP1 mRNA and PKD2 MO, but not single injection of either of the two, results in fish tail curling (Figure 7, A and B), presumably due to reduction in the PKD2 expression to below a threshold value by the coinjection. Further, we wanted to determine whether FUBP1 also regulates PKD2 KD-associated pronephric cyst formation. For this we employed FUBP1 overexpression through mRNA injection and found that FUBP1 mRNA injection significantly increases the occurrence rate of pronephric cysts induced by PKD2 MO KD in zebrafish (Figure 7, C–E). Thus, taken together, our data demonstrate that FUBP1 regulates PKD2-associated disease phenotypes (tail curling and pronephric cyst) in larval zebrafish, presumably through regulating PKD2 protein dosage. Effect of FUBP1 overexpression on tail curling and pronephric cystogenesis of larval zebrafish. (A) Representative pictures showing tails of 3 dpf zebrafish with injection of water (control; Ctrl), PKD2 MO, FUBP1 mRNA, or both PKD2 MO+FUBP1 mRNA within 1 hour postfertilization. (B) Average percentages of fish having a curled tail under different conditions: PKD2 MO injection alone (n=112), FUBP1 mRNA injection alone (n=152), and coinjection (n=95). *P<0.05; **P<0.01. (C) Ctrl (water-injected) larva at 3 dpf with straight tail and histologically normal glomerulus and adjacent tubules. (D) PKD2 MO-injected larva at 3 dpf showing curly tail and pronephric cyst formation (arrows), which is confirmed by a histologic section that also displayed dilated pronephric tubules (★). (E) Average percentages of fish exhibiting pronephric cysts under different conditions: PKD2 MO (0.15 ng) injection alone (n=257), FUBP1 mRNA (200 pg) injection alone (n=157), and coinjection (n=248). G, glomerulus; Pt/Pd, pronephric tubule/duct; Nc, notochord. **P<0.01. We next investigated whether 3FI and FUBP1 are physically linker to the initiation of translation, which may be the basis for the downregulation of PKD2 translation by 3FI and FUBP1. It is well known that 4EBP1 binds to eukaryotic initiation factor-4E (eIF4E) to disrupt the eIF4E–eIF4G initiation complex thereby reducing the translation initiation activity. Several RNA-binding proteins are known to bind 3′UTR and reduce the formation of initiation complex eIF4E–eIF4G through interacting with 4EBPs.19,31 We thus first used co-IP assays to see whether FUBP1 interacts with 4EBP1. In both HEK and HeLa cells, we found that FUBP1 indeed precipitates 4EBP1 (Figure 8A), indicating that they are in the same protein complex in these cells. To determine whether they associate directly with each other, we performed GST pull-down assays. For this purpose, we divided human FUBP1 into three overlapping fragments, the N-terminus (NT; aa 1–112), central domain (CD; aa 100–447) and C-terminus (CT; aa 442–644), and purified them from Escherichia coli. We found that the CD, but not the two other fragments, is able to precipitate 4EBP1 protein purified from E. coli. (Figure 8B). Further, we found that addition of 3FI RNA, but not a control RNA fragment, significantly increases the binding between the FUBP1 CD and purified 4EBP1 (Figure 8C). Interestingly, FUBP1 CD was found to have four K-homology (KH) domains for DNA and RNA binding. These data suggest that the inhibitory effect of 3FI and FUBP1 on PKD2 translation is mediated by the FUBP1–4EBP1 binding strength. In summary, these experiments together demonstrate that FUBP1 is indeed physically linked to 4EBP1, a regulator of the initiation of translation. Interaction between FUBP1 and 4EBP1, and effect of 3FI. (A) Co-IP experiments using native HEK and HeLa cells. FUBP1 antibody was used for precipitation and 4EBP1 antibody for immunoblotting. (B) GST pull-down experiments using purified GST-tagged human NT (aa 1–112), CD (aa 100–447), and CT (aa 442–644) peptides and GFP-tagged human 4EBP1 protein from E. coli. (C) Effect of 3FI on in vitro binding between purified GST–CD and GFP–4EBP1. Left panel shows representative WB data. The reaction system containing purified GST–CD and GFP–4EBP1 was supplemented with 3FI RNA, an unrelated RNA (Ctrl RNA), or none. GST pull-down assays were then performed, with GST and GFP antibodies for immunoblotting. Right panel shows quantified and normalized WB data averaged from three independent experiments. NS, not significant. *P=0.03. We previously reported that PKD2 is translationally upregulated under cellular stress conditions and that this regulation is related to the presence of a conserved short upstream open reading frame fragment in the PKD2 mRNA 5′UTR.18 In this study, we investigated the role of PKD2 mRNA 3′UTR in the regulation of PKD2 protein level. Using dual-luciferase assays and RT-PCR we have shown that human PKD2 3′UTR represses the protein translation of luciferase. We then identified the inhibitory nt fragment 3FI (nt 691–1044) and, by biotin-labeled RNA pull-down assays, its binding protein FUBP1. We have shown that FUBP1 does exhibit an inhibitory effect on PKD2 translation, but not transcription, in cultured cells. Finally, we have shown that, in embryonic zebrafish, FUBP1 regulates the severity of tail curling and pronephric cystogenesis due to PKD2 MO KD, presumably through regulating PKD2 expression in a similar way to that observed in cultured cells. A “two hit” model was first proposed in 1992 to illustrate a possible mechanism underlying the cystogenesis of ADPKD.32 This hypothesis suggested that the occurrence of a somatic mutation in the remaining normal allele of some cells initiated cyst formation in the affected cells. In other words, ADPKD is recessive at the cellular level. This model received strong support from the identification of somatic mutations that inactivated the normal alleles in 20%–43% of the analyzed PKD1 or PKD2 renal cysts.33–36 However, no somatic mutation in the normal allele was found in the remaining cysts. Over the past decades, evidence has been increasing in support of a “dosage” model that suggests renal cystogenesis can be initiated when the wild-type PKD1 or PKD2 protein level is reduced below a threshold level in the absence of a somatic mutation.37–39 Therefore, it became important to elucidate how PKD1 and PKD2 protein expression is regulated to identify new therapeutic targets, especially as the outcomes of previous clinical trials are rather negative. 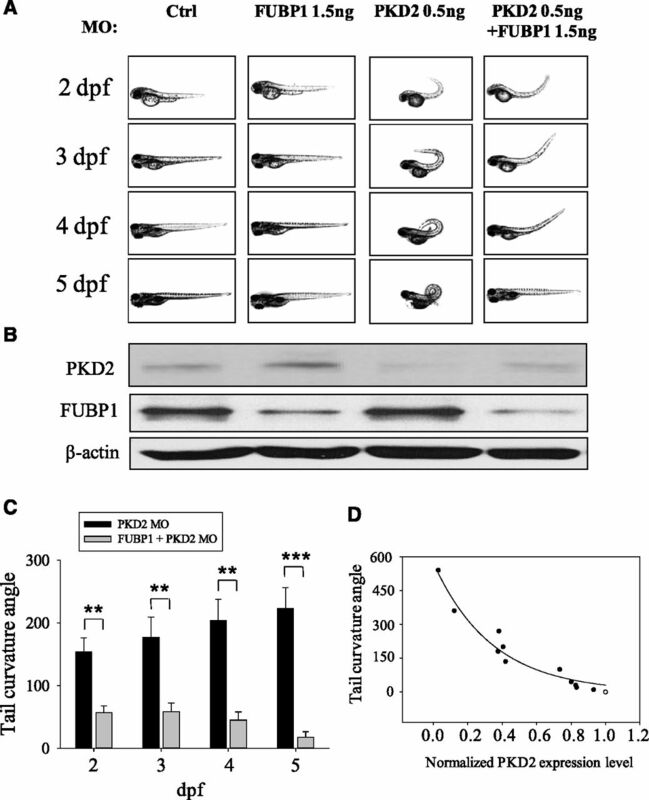 FUBP1 identified in this study is a novel translational regulator of PKD2 and indeed regulated PKD2-associated zebrafish tail curvature and pronephric cystogenesis, which can be accounted for by changes in the PKD2 protein dosage. The fact that both loss- and gain-of-function of PKD2 are pathogenic indicates that the PKD2 protein level must be strictly regulated within a narrow range.3,6 Consistent with this, it is known that PKD2 protein expression is developmentally regulated40, whereas generally the protein level is regulated transcriptionally or translationally. By computational analyses, putative binding sites for transcription factors E2F, EGRF, ETS, SP1, and ZBP-89 were identified in the promoter region of both human and mouse PKD2.41 To date, however, there have been little experimental data available regarding transcription factors that regulate PKD2 transcription, suggesting that translational regulation of PKD2 plays an important role. Indeed, a short upstream open reading frame in PKD2 mRNA 5′UTR is implicated in the translational up-regulation of PKD2 by cellular stresses18, and microRNA-17 post-transcriptionally downregulates PKD2 expression by binding to its mRNA 3′UTR thereby promoting cell proliferation.26 Furthermore, it was reported that the RNA-binding protein bicaudal C upregulates PKD2 expression by antagonizing the repressive activity of miR-17 through binding competitively to the same site on the PKD2 mRNA 3′UTR.7 Of note, the 3FI and 3FS identified in this study do not overlap with the miR-17 binding site. Taken together, these data show that 3′UTR possesses multiple elements important for complex regulation of the PKD2 protein level. FUBP1 was first identified as a single-strand DNA-binding protein that upregulates the transcription of proto-oncogen c-Myc through binding to the far upstream element in the promoter region 1.5 kb upstream of the transcription start site.42 FUBP1 promotes cell proliferation, survival and metastasis through up-regulating c-Myc and plays important roles in organ development, including lung, brain, and neural network development.27,43,44 In contrast, FUBP1 was known to transcriptionally downregulate the expression of TNFα.45 Interestingly, c-Myc is elevated in cystic tissues of various PKD models and TNFα is elevated in PKD2+/− mice.46–48 Moreover, c-Myc transgenic mice and in vitro application of TNFα to kidney in culture developed cysts.46,47 Thus, although FUBP1 altered the expression of three cystogenic proteins, PKD2 (down), TNFα (down), and c-Myc (up), whether and how FUBP1 is implicated in cystogenesis remains to be determined. Although FUBP1 was originally identified as a transcription factor of c-Myc, recent reports demonstrated that FUBP1 also functions as a RNA-binding protein for translational regulation of its bound genes, including GAP43, p21, Cox-2, and NPM.49–52 Similar to bicaudal C that contains three RNA-binding KH domains and binds to the 3′UTR of PKD2, FUBP1 has four KH domains. Sequence analysis found that FUBP1 binds to AU-rich regions in mRNA 3′UTR, which is supported by the fact that the FUBP1-binding 3FI contains 68% AU. FUBP1 is present in multiple tissues including kidney, liver, pancreas, thymus, ovary, and skin.53,54 In kidney FUBP1 is expressed at various locations, including podocytes and proximal and distal tubules (Supplemental Figure 2), and developmentally decreases53,54, whereas the PKD2 protein level increases in the kidney during development,40 consistent with downregulation of PKD2 translation by FUBP1. The presence of a physical interaction between FUBP1 and eIF4E-binding protein 4EBP1 suggests the complex 3FI–FUBP1 located at the 3′UTR of PKD2 mRNA is indeed connected, via 4EBP1, to the initiation complex located at the 5′UTR of PKD2 mRNA. Thus, our study may have identified a novel example of a ‘closed-loop' or ‘circular' model of mRNAs. 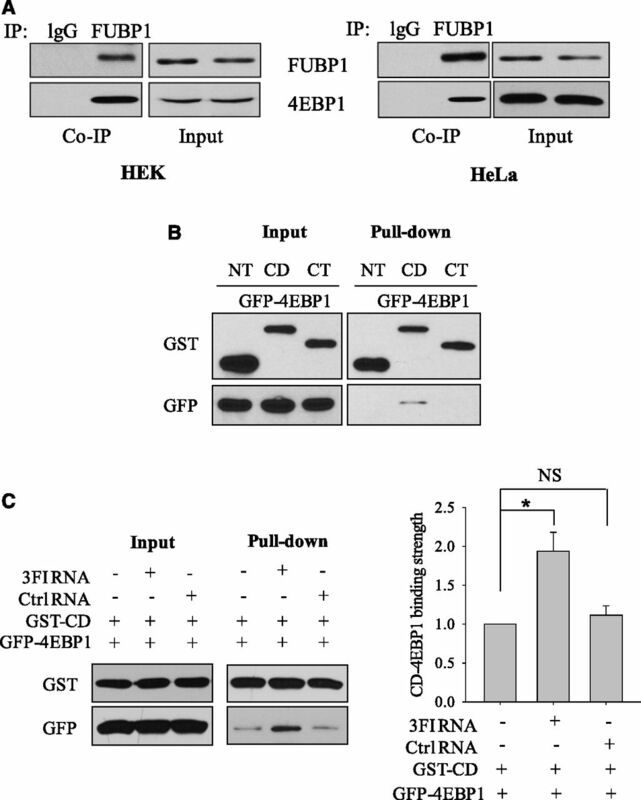 However, it remains to be determined whether 3FI and FUBP1 enhance 4EBP1–eIF4E binding, thereby reducing the eIF4E–eIF4G binding in the proximity of PKD2 5′UTR. In summary, we found that FUBP1 binds with the AU-rich 3FI in the PKD2 mRNA 3′UTR and negatively regulates PKD2 protein translation in cultured cell lines. In embryonic zebrafish, decreased FUBP1 by MO injection and increased FUBP1 by mRNA injection alleviates and aggravates, respectively, the tail curling and/or pronephric cyst occurrence due to reduced PKD2 level by MO injection, presumably through affecting PKD2 dosage. In fact, for human patients whose PKD2 mutant(s) remains partially functional, a peptide of FUBP1, a RNA fragment of human PKD2 3FI, or chemical that disrupts the FUBP1–3′UTR binding are potential drug candidates because they would abolish (or significantly reduce) the downregulation of PKD2 translation by FUBP1, thereby increasing PKD2 dosage and compensating for partial loss of PKD2 function. Our study thus unveiled a novel mechanism of dosage regulation that is important for ADPKD pathogenesis and might enable the discovery of new therapeutic targets in future studies. Human PKD2 mRNA 3′UTR composed of 2087 nt was amplified from HeLa cells with the following primers: forward: 5′-GTCGGGCCCTATGTGTGTTTCAGTATGTG-3′; reverse: 5′-CGCCGTTTAAACTTTCTGCTACTATATCAAG-3′, and subcloned into luciferase vector BI16,25 a kind gift from Dr. Ed Grabczyk (Louisiana State University, Baton Rouge, LA), at the ApaI and PmeI restriction sites. Fragments of human PKD2 mRNA 3′UTR were also cloned into BI16 at the same sites. Human FUBP1 coding sequence was amplified from plasmid pOTB7–FUBP1 purchased from Open Biosystems (Thermo Fisher Scientific, Waltham, MA) and inserted into pcDNA3.1(+). Flag tag was inserted at the 5′ of the FUBP1 coding region. All mutations were made with the QuikChange Lighting Site-Directed Mutagenesis kit (Agilent Technologies, Santa Clara, CA) and confirmed by sequencing. HeLa and HEK cells were cultured in DMEM supplemented with 10% FBS and 1% penicillin/streptomycin (Sigma-Aldrich, St. Louis, MO). Cells of fewer than 25 passages were cultured to full confluence before collection. Transient transfection was performed on cells cultured to 70%–90% confluence using Lipofectamine 2000 (Invitrogen, Carlsbad, CA) according to the manufacturer's instructions. Rabbit antibodies against PKD2 (H-280) and FLAG (D-8), goat antibody against FUBP2 (D-12), and mouse antibodies against firefly luciferase (Luci 21 1–107), β-actin (C-4) green fluorescent protein (GFP; B-2), GST (B-14), and 4EBP1 (P-1) were purchased from Santa Cruz Biotechnology (Santa Cruz, CA). Mouse antibody against renilla luciferase was purchased from Chemicon International (Temecula, CA). Goat antibody against PKD2 and rabbit antibody against FUBP1 were from Aviva System Biology (San Diego, CA). Secondary antibodies were purchased from GE Healthcare (Waukesha, WI). KD of human FUBP1 by siRNA was performed using oligonucleotides at a final concentration of 20 nM with transfection reagent Lipofectamine 2000 according to the manufacturer's instructions. siRNA oligonucleotides were purchased from Santa Cruz Biotechnology (Cat no. : sc-43760) and control siRNA from Gene Pharma (Shanghai, China). The efficiency of the siRNA KD was assessed by WB. Wild-type zebrafish AB strain was maintained and staged as previously described.59,60 Embryos were kept in E3 solution. A translation-blocking antisense MO (Gene Tools LLC, Philomath, OR) was injected at the one-cell stage within 1 hour postfertilization, as described,28 for zebrafish PKD2 KD. A translation-blocking fubp1 MO (Gene Tools LLC) was also used. The MO sequences were as follows: pkd2, 5′-AGGACGAACGCGACTGGAGCTCATC-3′; fubp1, 5′- GGCCATGTCTGCACGAACAGTCTTC-3′; gli2 (an antisense mismatch morpholino, used as a negative control), 5′-CCTCTTACCTCAGTTACAATTTATA-3′.61 Capped human fubp1 mRNA was synthesized using the mMessage mMachine T7 kit (Ambion, Austin, TX) and injected into fertilized embryos (at 200 pg each). Embryos at 3 dpf were fixed in 1.5% glutaraldehyde, 1% paraformaldehyde, 70 mM sodium phosphate, pH 7.2, and 3% sucrose overnight at 4°C. After being washed in PBS and taken through an ethanol dehydration series, the embryos were embedded in glycolmethacrylate (JB-4; Polyscience, Warrington, PA) according to the manufacturer’s instructions and sectioned at 4 μm. Slides were stained with methylene blue and azure II,62 mounted, and examined under a microscope. The study was approved by the Ethical Committee for Animal Experiments of the University of Alberta, and was carried out in accordance with the Guidelines for Research with Experimental Animals of the University of Alberta and the Guide for the Care and Use of Laboratory Animals (National Institutes of Health Guide) revised in 1996. Total cellular RNA was prepared using TRIzol reagent (Invitrogen), according to the manufacturer's manual. Contaminating DNA was digested with RNase-free DNase (Promega, Madison, WI). Single-strand cDNA synthesis was carried out using Superscript III reverse transcription (Invitrogen), according to the manufacturer's instructions. End-point PCR was performed using 28-cycle protocol with Taq DNA polymerase (Invitrogen). The oligonucleotide primers for each gene were as follows: β-actin, sense 5′- CCTGGCACCCAGCACAAT-3′ and antisense 5′- GGGCCGGACTCGTCATACT-3′; firefly luciferase, sense 5′- CGTTCGTCACATCTCATCTACCTCC-3′ and antisense 5′- GCAGAGCGACACCTTTAGGCAGACC-3′; renilla luciferase, sense 5′- CATTCAAGGAGAAGGGCGAGGTTAG and antisense 5′- TGTAGTTGCGGACAATCTGGACGAC-3′; pkd2, sense 5′- GTATGACGGCTCACGCCTGTAATCC-3′ and antisense 5′- AGAGATGGAGTTTCGCCACATTGCC-3′; fubp1, sense 5′- CATAGAAGAAAAGATTGGTGGC-3′ and antisense 5′- AGGATTATAAGGTGCAGGGTTG-3′. Real-time PCR was performed using a 7900HT Fast Real-time PCR System (Applied Biosystems, Foster City, CA) with the same primers. Fast SYBR Green Master Mix (Invitrogen) was used. 7900HT Fast Real-Time PCR System 2.4.1 software was used to perform quantification and to generate cycle threshold values. Templates for in vitro synthesis of biotinylated RNA were generated by PCR from the BI16 vector with or without human PKD2 mRNA 3′UTR fragments. Forward and reverse primers are as follows: forward, 5′-AAATTAATACGACTCACTATAGGGACGAGCAGTAATTCTAGAGG-3′ (the T7 promoter sequence is underlined), reverse, 5′- GGGCAAACAACAGATGGCTGGCAAC-3′. Biotinylated RNA was synthesized using the mMessage mMachine T7 kit (Ambion) in the presence of 14Biotin- uridine 5′-triphosphate (Roche, Basel, Switzerland) and purified using phenol:chlorophorm extraction and MegaClean columns (Ambion). Biotin–RNA pull-down assays were carried out as described previously.63 Briefly, the biotinylated RNA was bound to streptavidin-coated Dynabeads (Invitrogen) according to the manufacturer's instructions. The cytoplasmic extracts of HeLa cells were precleared by incubation with RNA-affinity resin containing a control fragment. The unbound fraction was incubated with RNA-affinity resin containing human PKD2 mRNA 3′UTR fragments in the binding buffer (40 mM potassium chloride, 1.5 mM magnesium chloride, 0.2 mM EDTA, 1 mM dithiothreitol, 6% glycerol, 2 μg/μl heparin, 20 mM HEPES, and pH 8.0) supplemented with 15 μg/ml yeast tRNA (Sigma-Aldrich) and 200 U/ml RNaseOUT (Invitrogen). After 2 hours of incubation at 4°C, the unbound proteins were removed and, after extensive washes with the binding buffer, the proteins were eluted by boiling in Laemmli buffer and resolved on SDS-PAGE. Protein bands were cut for mass-spectrometric analysis (University of Alberta, Edmonton, AB). RIP assay was carried out as described previously.64 Briefly, HeLa cells were transfected with pCGNM2 harboring human HA–FUBP1 (a kind gift from Dr. David Levens, National Institutes of Health). Forty-eight hours after transfection, cells were collected using RIP buffer (150 mM potassium chloride, 25 mM Tris, pH 7.4, 5 mM EDTA, 0.5 mM dithiothreitol, 0.5% NP-40, 100 U/ml RNAase inhibitor [Invitrogen], proteinase inhibitor mixture), and cell debris pelleted by centrifugation at 13,000 rpm for 10 minutes. HA tag antibody (Santa Cruz Biotechnology; catalog no. : sc-805) or control IgG (Abcam, Inc., Cambridge, MA; catalogue no. : ab27478) was added to the supernatant and incubated for 4 hours at 4°C with gentle rotation. A total of 50 μl protein G-Sepharose beads (GE Healthcare) were then added and incubated for 2 hours at 4°C with gentle rotation. Beads were pelleted at 2500 rpm for 30 seconds and washed three times with RIP buffer, followed by one wash in PBS. Coprecipitated RNAs were then isolated with TRIzol and RT-PCR assays were performed with following primers: pkd2, sense 5′-GTATGACGGCTCACGCCTGTAATCC-3′ and antisense 5′-AGAGATGGAGTTTCGCCACATTGCC-3′; β-actin, sense 5′-CCTGGCACCCAGCACAAT-3′ and antisense 5′-GGGCCGGACTCGTCATACT-3′. Protein isolated by the beads was detected by WB. HeLa and HEK cells were cultured and transfection was performed as described above with plasmids BI16 with or without a human PKD2 mRNA 3′UTR fragment. At 12 hours after transfection, cells were collected and dual-luciferase assays were carried out with Dual-Luciferase Reporter Assay System (Promega) according to the manufacturer’s instructions. Relative luciferase activity was assessed as the ratio of renilla to firefly luciferase units (relative light units). HEK or HeLa cell monolayers in 100-mm dishes were washed twice with PBS and solubilized in ice-cold CellLytic-M lysis buffer (Sigma-Aldrich) supplemented with proteinase inhibitor mixture. Supernatants were collected after centrifugation at 16,000 × g for 15 minutes. Equal amounts of total proteins from postnuclear supernatants were precleared for 1 hour with protein G-Sepharose, and then incubated for 4 hours at 4°C with the antibody against FUBP1. After the addition of 100 μl of 50% protein G-Sepharose, the mixture was incubated overnight with gentle shaking at 4°C. The immune complexes absorbed to protein G-Sepharose were washed five times with Nonidet P-40 lysis buffer (50 mM Tris, pH 7.5, 150 mM sodium chloride [NaCl], 1% Nonidet P-40) with proteinase inhibitor and eluted by SDS loading buffer. Precipitated proteins were analyzed by WB using the antibodies against FUBP1 and 4EBP1. Two micrograms of purified GFP-tagged human 4EBP1 from E. coli was incubated with 2 μg purified GST-tagged human FUBP1 fragment from E. coli in the binding buffer (50 mM Tris, pH 7.5, 150 mM NaCl, 1 mM calcium chloride). The mixture was incubated at room temperature for 1 hour with gentle shaking, followed by another hour of incubation after addition of 100 μl 50% glutathione-agarose beads (GE Healthcare). The beads were then washed several times with 140 mM NaCl, 10 mM Na2HPO4, 1.8 mM KH2PO4 pH 7.5, and the remaining proteins were eluted using 1× SDS loading buffer and resolved by SDS-PAGE and transferred to a nitrocellulose membrane (Bio-Rad, Hercules, CA). The membrane was then immunoblotted with GFP and GST antibodies. Data were analyzed and plotted using Sigmaplot 12 (Systat Software, San Jose, CA), and expressed as mean±SEM (N), where N indicates the number of experimental repeats. Paired or unpaired t tests were used to compare two sets of data. A probability value (P) of less than 0.05, 0.01, and 0.001 was considered statistically significant and indicated by *, **, and ***, respectively. W.Z. is a recipient of the Alberta Innovates-Doctoral Graduate Student Scholarship. This work was supported by the Natural Sciences and Engineering Research Council of Canada, the Kidney Foundation of Canada, the Canadian Institutes of Health Research (to X.Z.C. ), and the National Natural Science Foundation of China (Grant 81570648, to X.Z.C. ; Grant 31171412, to Y.C.). W.Z. and F.S. contributed equally to this work. This article contains supplemental material online at http://jasn.asnjournals.org/lookup/suppl/doi:10.1681/ASN.2015070836/-/DCSupplemental.